In August 2014 we acquired for our clients the most advanced GE Healthcare device - OPTIMA MR 450w GEM 1,5T T. It is a premium model of this manufacturer. Since 2009 we have been using radiology information system by ICZ which enables sharing and sending results of the examinations via a secured electronic way e-PACS and REDIMED. Extension of the examination spectrum by MR angiography and the possibility of cancer screening. The staff is of course highly erudite and are able to make use of these technologies for the benefit of the patient. Magnetic Resonance is modern examination method which very accurately and in detail displays required areas of a human body. Individual organs are scanned in thin layers (slices) usually 1-5mm thick. 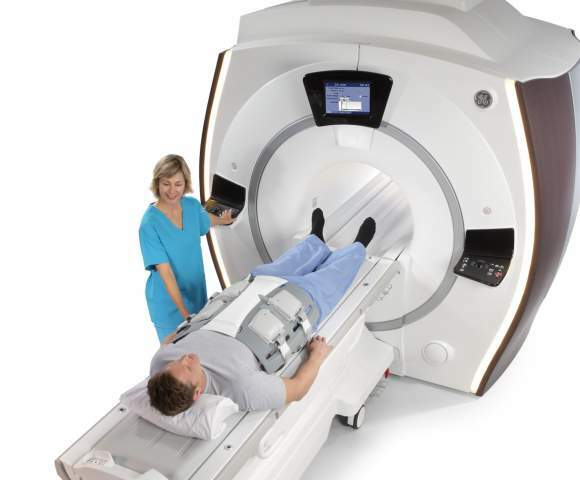 MR Imaging does not work on the principle of X-rays, but uses a very strong magnetic field. MR examination is safe and is without potentially harmful ionizing radiation. MR results provide physicians with very important information about practically all organs in our body. Magnetic resonance is very often used for the examination of the brain, spinal cord and is irreplaceable in neurological, orthopedic and oncological examinations. MR is also used for suspected vascular diseases and tumors of the brain, various spine injuries and prolapsed intervertebral discs. Another important role of MR is in musculoskeletal examinations. The only area which magnetic resonance cannot image very well are bones as they contain hardly any water. A human body is composed by two thirds of water, water is thus represented in each tissue. Magnetic resonance only works with tissues that contain water or possibly hydrogen. A water molecule consists of 2 hydrogen atoms and one oxygen atom. Hydrogen nucleus consists of a single proton. This proton rotates very quickly and the combination of proton charge and its quick rotation creates a magnetic field. Thanks to its magnetic pole the hydrogen proton has a strong magnetic moment. It means that if the proton is in the outer magnetic field, it the magnetic field finds its way parallel with the lines of force of the outer field. Moreover, proton rotates around its own axis. If we put a human into a strong homogeneous magnetic field, all the hydrogen atoms in their body have the axis of precession motion parallel with outer magnetic field. Why? The protons have, thanks to its magnetic moment, adapted. However, some of the atoms align its axis in the direction of the outer field, others in the opposite direction. The magnetic fields of such proton pairs cancel each other out. Magnetic resonance can only work with those atoms-solitaires which would not cancel their magnetic fields. There are only a few of these in a million of atoms, but it is still good enough to scan human tissues perfectly. MR scanner can “see” them and his eyes are pulses of radio frequency energy (RF). It is nothing other than radio waves (known from using the radio or television). MR scanner has both transmitting and receiving antennas. Both the tasks are performed by special coils that are places as close to the patient’s body as possible. Each MR scanner is equipped with body coil, head coil, but there are also knee coils. The coils-antennas then transmit RF waves with a specific frequency and hydrogen atoms absorb their energy. The transmission makes atoms precess at a different frequency and different vector. When the coils stop transmitting, the vectors of atoms return to their original (forced by stronger outer magnetic field) and in this moment the atoms emit the absorbed energy. The tissue “shines” for a moment, the atoms emit “resonance waves”. This “weak light” - in fact an incredible amount of incredibly weak high-frequency signals – is received by the coils which turn from transmitting antennas into receiving antennas. This process repeats periodically once in 30 to 3000 milliseconds. The image is obtained by magnetic field and radio frequency pulses affecting hydrogen atoms nuclei which are part of each water molecule – H2O – and water is contained in a greater or lesser degree in every tissue of the human body. The water molecule hydrogen constantly rotates around its own axis and has its own magnetic moment. Due to the effect of magnetic fields and short radio frequency waves the hydrogen nuclei deflect from their rotation axis and on the way back they emit a weak electromagnetic energy signal, which is measurable. The computer processes the electromagnetic resonance signals into the final image - cross-section of the examined body part where you can see structures or organs differentiated from each other in different shades of gray (from white to black).